Do you want to influence a room with your sets? If your first thought is yes, then these lessons are for you. In your package of choice, you will learn the aspects of DJ’ing with the very best hardware: from set-up and technique, to phasing and suspense. Because you will be taught in private classes, you will receive intensive and personal guidance. So that afterwards you can get on stage with confidence. Discover the art of DJ’ing on professional gear with an introduction class! In two hours, you will learn the basics of working on the Pioneer DJ CDJ Nexus of experienced DJ’s. After the class, you will also have the possibility to practice your music on the set in the MPA Live Room and you may choose to enroll in the DJ Clinics packages. Learn all the basics of DJ’ing in four classes of two hours. In these classes, you will be taught all the basic aspects on ‘state of the art’ gear, with a teacher that takes your preferred music genre into account. 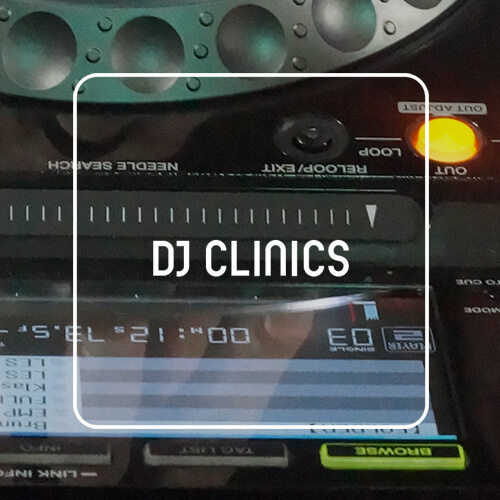 The DJ Clinics are all private lessons, so you will receive the personal coaching to reach your goals. After each class you will get an extra hour to practice your set on our gear. Do you already have experience as a DJ, but want to learn the essentials of making that perfect set? For you we have the DJ Clinics Advanced. Learn to work with suspense, switching in genres, working with stems and more during these four lessons of two hours! Do you want to work on your own music after these clinics with another MPA Course? Then you will receive 10% discount on every other course you register for. The study load for this Course is 4 hours per week (based on one class per week). The study load can vary per student and includes the hours of lessons to be followed at our school. During a free intake you can ask our teachers for more information about the study load and further content of this Course! The DJ Clinics are taught by the experienced DJ Beau Zwart. Beau started making music at a young age. After the classical piano was exchanged for a midi keyboard, he went from Mozart to Beau Zwart: a versatile producer and DJ who divides his time between producing, performing and sharing his knowledge. Beau has been in line-ups with Benny Rodrigues, Olivier Heldens and Klankarussell. Until this day he is part of the Give Soul collective and can be found behind the decks of the bigger Dutch venues each weekend. As a certified school, we strive to provide and communicate all necessary information to all our students and customers as transparant as possible. The terms and conditions for students can be found here and our procedure for files and complaints can be found here.